After the release of Jason Lives: Friday The 13th Part 6 in 1986, over six years had passed since Paramount Pictures had first purchased Sean S. Cunningham’s low budget thriller Friday the 13th as a negative pick-up. Since that time the franchise had earned well over $150 million dollars in worldwide box office receipts. Producer Frank Mancuso Jr. had already begun distancing himself from the Friday The 13th franchise in 1985, after a solid run with four films under his belt, but he continued to oversee the production of the following two sequels. Shortly after the release of Jason Lives, Frank Mancuso was contacted by Mel Harris, the head of Paramount Television, to discuss the possibility of taking Friday The 13th from the big screen to the small screen. At the request of Harris, Mancuso would be in charge of adapting Friday The 13th into a television series but was unfortunately advised that the show could have no direct relation to the movie franchise nor feature any references to Jason Voorhees or Camp Crystal Lake. A bit deflated, Mancuso was initially hesitant about producing a television show called Friday The 13th that did not feature Jason Voorhees or Crystal Lake. He feared the fans would feel cheated and that the new show's ratings would suffer immediately upon release into syndication. However, Mel Harris did give Frank Mancuso freedom to create whatever kind of show he wanted, which was appealing to Mancuso and allowed him the opportunity to ultimately conceive a narrative storyline surrounded by strange and bizarre occurrences. With only the title Friday The 13th to work with, Mancuso had neither an idea nor a concept of what type of show to put into production. Frank would eventually be introduced to a young writer named Larry B. Williams. Working long hours with Williams, the pair fleshed out a story that revolved around an antique store in New Orleans called Curious Goods. The story would have the store owner struggling to make a profit and in turn selling his soul to the Devil in return for a successful business. The owner does indeed begin to receive great wealth from his deal with the Devil, but his greed would eventually cost him his life. After his death, the store would be given to his niece, and aided by her cousin, the duo would unknowingly begin selling off many of the cursed items. That was until a mysterious older man warned the family members of the evil that they had unleashed upon the world. Even though Frank Mancuso Jr. was excited at the concept of the new show, he was still reluctant to call the series Friday the 13th and approached Paramount once more to change the title. This time he suggested calling the new show The 13th Hour, but Mel Harris insisted that the title Friday The 13th remain for connection to the films for marketing purposes. Focus groups were even surveyed about using Friday The 13th in association with the storyline of the new series with results showing the majority of viewers would be turned away with the use of the title. Mancuso hoped that the survey would convince Paramount to go with his The 13th Hour title for the show instead, but ultimately the prospect of Friday The 13th on television won out and production on the show was under way. Writer Larry B. Williams created the pilot episode to screen for Paramount brass in order to show the concept of the new television show. With the successful pilot in hand, Friday The 13th was pre-sold along with another Paramount franchise stalwart Star Trek: The Next Generation for syndication. Frank Mancuso Jr. then began to put together various stories that Larry Williams and a number of guest writers could adapt into screenplays. One of those young writers that would contribute scripts for the show was Rob Hedden, who would later go on to direct Friday the 13th Part 8: Jason Takes Manhattan. Filming on Friday the 13th: The Series took place in Toronto, Canada, which had become a popular location for filmmakers due to the low production costs. Due to a short schedule for each episode and a degree of freedom, many of the filmmakers (including Jason Lives director Tom McLoughlin) were excited with the opportunity to work on a high concept show with expansive ideas and haunting stories. The pilot episode of Friday the 13th: The Series, titled The Inheritance, made its debut on September 28th 1987, the same day as the aforementioned and highly anticipated show, Star Trek: The Next Generation. By the end of the first season for both shows, they ranked number one (Star Trek) and number two (Friday The 13th) in the syndicated television ratings. The main characters in Friday the 13th: The Series were Ryan Dallion and Micki Foster, the niece and cousin that take over the store Curious Goods when Micki’s uncle, Lewis Vendredi (French for Friday), dies of mysterious circumstances. John D. LeMay auditioned for the part of Ryan in Friday the 13th: The Series for which he eventually won the role (John would also go on to star in Jason Goes To Hell: The Final Friday six years later). His co-star, Louise Robey pursued a singing career in Paris and also enjoyed success as a model prior to auditioning for and winning the role as Micki for the Friday The 13th show. Two other necessary roles for the show first included the character Jack Marshak. He was a friend of Micki’s uncle Lewis, knew of the danger of the objects in the store and appeared to warn the niece and cousin of the curse that surrounded the items they were selling. Actor Chris Wiggins took on the role of Jack, who was born in Blackpool, England but moved to Canada and eventually began his career in theatre before transitioning to television in the late 1950s. The role of Uncle Lewis was brought to life by R. G. Armstrong, a veteran of numerous television shows during the 1950s and 1960s. He made appearances in The Fugitive, The Twilight Zone, and Alfred Hitchcock Presents. Upon the first airing of Friday The 13th: The Series, many fans of Friday The 13th were exceptionally disappointed with the fact the show had no connection to the films. 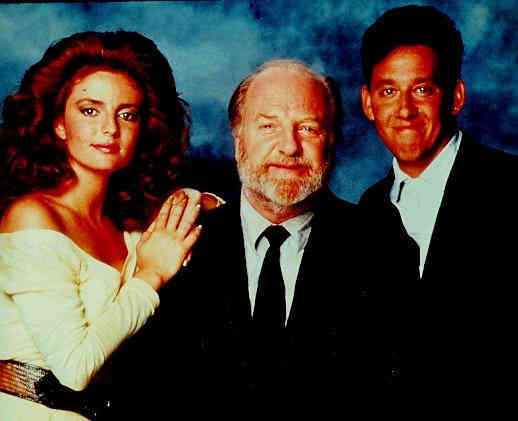 Eventually, the show would gain a strong following and armed with positive critical reviews, Paramount executives greenlit a second season into a rushed production for airing in late 1988. By the end of the second season, John D. LeMay had decided that he no longer wanted to portray his character Ryan and exited the show with the two-part season cliff-hanger titled The Prophecies. Eventually, the initial success of the show dissipated with the exit of John LeMay's character, coupled with the catch 22 of positive/negative reaction to the Friday The 13th name. Friday the 13th: The Series would eventually be cancelled after three season and seventy-two episodes on May 26th 1990. By the end of the show's run, Paramount Pictures had decided it no longer had interest in Friday The 13th as a brand and sold the rights to New Line Cinema.